Quarter of a Century in the Old Lytham Mill. The last tenant of the Lytham windmill, when it ground corn - today it is a cafe - Mr. William Swann, 58, Warton Street, Lytham, died on Wednesday at the age of 76 years. He had been in ill-health for some time. A widow and one son, Harold, are left to mourn their loss. Mr. Swann was a native of Treales and he learned how to grind corn at the village mill. Then he removed to Preston where he was employed by a firm of millers, and 36 years ago he came to Lytham. He tenanted the mill for 25 years, his work there ending when a fire put the mill out of action in January, 1919. He had a great regard for the old mill and never tired of telling its history to his many more or less distinguished visitors. He made half-a-dozen models, five of which were sold at bazaars, and he was engaged on a seventh when illness made him lay aside his tools. "It is said to be the oldest in the country; at least it was erected on the site of a mill believed to be in existence in the 12th century. Scores of names were carved on the oaken beams, and the woodwork and the pillars were covered with hundreds of visiting cards left by people who had responded to the miller's invitation - to have a look round.' Many notable people visited the mill and left their cards, including a Lusitania survivor, music-hall artistes and other celebrities." 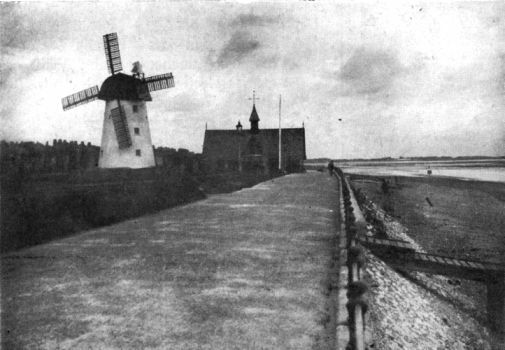 The mill is closely linked with the history of Lytham; in fact, no history of the town would be complete without mention of the Mill. "Prior to the fire there was a piece of leadwork in the mill dated 1663. But chroniclers of history tell us that there was a mill in existence as far back as 1190 [on another site]. Certainly its history can be dated much further back than the 17th century. The 'Wyn Milne' is referred to in a deed of 1327 under the hood of the Prior of Lytham. The mill belonged to the Priory, and in 1337 there was granted a right to one John de Brede-Kyrke to grind corn at Lytham Mill. "The present structure was built somewhere about 1760 , which before the fire stopped its work, made it the oldest working mill in the Fylde. The present sails are merely dummies and are neither as long nor as heavy as the original sails. Each of the four sails was forty-five feet long, the span being ninety feet and the weight twenty tons. To bear the great weight of these huge sails necessitated a five feet thick at the base. "The grinding stones were five feet in diameter, and one of the millstones. came from the old Wrea Green mill about 1860. The millstone had been in use at Wrea Green for nearly a century. On the central shaft of the mill was the inscription : This is called the upright shaft—it has done its work for 150 years." Newspaper cutting from the Lytham St.Annes Express, 1930. Lytham windmill, one of the resort's major tourist attractions might be made operational again. The Fylde Leisure and Amenities Committee last night discussed a report on the mill by chief technical officer Mr D. Illsley. Mr. Illsley said that if corn could be ground at the mill again, the tourist attraction would increase and there would be a great deal of beneficial publicity. He added: "In view of the importance the mill has in local lore, I will never be happy until I have satisfied myself that renovation is beyond reasonable expense." The committee decided to apply for a supplementary estimate of £1,700 to get the structure in reasonable condition and that a further report into the mill's future be produced. Coun. Aiken said he agreed with the mill being preserved, but asked: "Is there any point in getting it operational again?" Coun J. E. Gouldbourn remarked that this was the first really imaginative report produced by an official for a long time. It could even be made commercial, animal feed could be ground there, and he also suggested putting a little shop there to sell flour. He felt sure that one of the big flour combines would be interested and that it was very worth while. Coun M. Corbett stressed the publicity value of such an enterprise. Coun R. Spencer, MBE, agreed with retaining the mill, because, he said, it was one of the finest standpoints in the Fylde, and so well known. He pointed out, however, that there would be an extra cost involving staffing the mill if it were operational. Coun G. Caldwell pointed out that many mills were being restored operationally in Holland. Wind provided energy if harnessed and such a mill could be used to generate stored electricity.